In order to do some cool things, you have to suffer a little, I guess. Two nights before we left Miraflores (Lima), we tossed and turned endlessly all night while a group of Chileans partied until 7 a.m. outside our room on the rooftop terrace. After mentioning it to the owner when he asked how we slept, he told us to be sure to tell them if we had any more problems. The next night we suffered again as another group chatted endlessly. I went out to ask them to quiet down, sort of a no no in the hostel world, and found that one of the hostel employees was part of the group. Lovely. Even more unlucky for us was that our flight was at 5:30 a.m. Our wake up call from the hostel employee never came, go figure, and Dusty’s iPod alarm was set for p.m. Needless to say it was sheer panic when the taxi arrived at 3:10 and we weren’t ready to go. We did make it in time, thankfully, and boarded our $87 flight for Cusco. 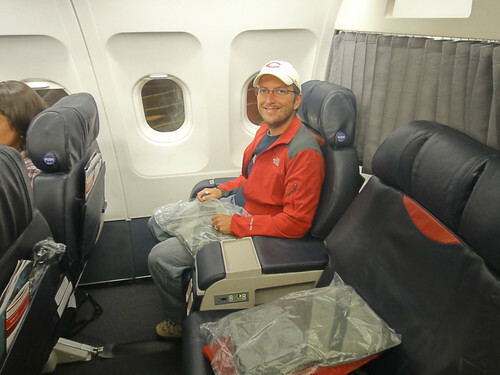 Not only did we make it, we were unexpectedly and unexplainably upgraded to first class! Thanks, Taca! Once we arrived in Cusco we began the hunt for a hostel. For those who have never stayed in a hostel, it’s quite different than checking into a hotel. We never book one in advance for many reasons. For one, hostels are listed on multiple booking sites and can’t keep up with their actual availability possibly leaving us out in the cold. Secondly, it’s very difficult to believe pictures. It’s not like we’re dealing with Holiday Inn’s here. We try not to have any expectations. Thirdly, it’s difficult to trust hostel reviews. We are somewhat older backpackers and actually like to sleep. Many reviewers are those staying in the bunk rooms and ready to party. We have some hostels in mind to look at as well as a general location where there might be others to check out just in case. Ring the bell of what is often a nondescript building. There might be a name posted somewhere. They’ll buzz us in past the locked gate at which time we ask if they have a habitacion privada or matrimonial. We discuss price. We’ve learned to just say, “No, that’s over our budget” at which time they sometimes lower the price. Sometimes they cut it to less than half if it’s low season and they’re hurting or if it’s late at night and they want someone in the bed. We’ll also ask for a discount if we’re staying for what seems like a lengthy time for the area. We ask whether the bathroom is private or shared, if there is wifi and if there is breakfast included. If things are going our way, we ask to see the room. We also turn the water on to make sure it is hot and check the internet to make sure it is actually working. If we don’t like it, we’ll say thank you and move on to the next place. This happens all the time. After visiting 15 cities and countless hostels, I still feel bad about it. If it is good or if our brains are “done shopping”, we’ll take it. More often than not we end up in what would equate to a flea bag hotel at home although if that happens we usually go out the next day when we are refreshed and find something better. Our hostel search in Cusco wore on us even more than usual. Turns out shlepping around a backpack full of everything you own is more difficult at 10,800 feet above sea level. Oh wahhh, I’m sure you’re thinking. Hostel and restaurant searching are officially my least favorite thing about travel. This is what you have to deal with while trekking across a continent, I guess. So, we stumbled upon Amaru Hostel at which we thanked the receptionist but told her the room was out of our budget. She quickly asked what our budget was and found us a room at one of their sister hostels, Hosteria de Anita. Not only was the room discounted from $35 to $25 per night but they also honored our South American Explorers discount of 10%*. We loved our new hostel which was so cozy and had a wonderful staff. 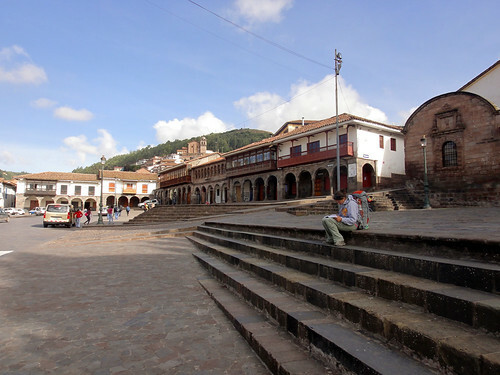 Cusco itself had very narrow cobblestone streets and a grand plaza which were interesting. Other than that, it was mostly a jumping off point for Machu Picchu as it is for most people. Man, this is a downer post isn’t it? We promise much more excitement in the next one! Very comfortable room and friendly staff.